Batley's Brad Day looks for a gap in the Hull KR defence last Sunday. Batley Bulldogs crashed to a 68-4 defeat at the hands of Kingstone Press Championship leaders Hull KR at Fox’s Biscuits Stadium last Sunday. Rovers ran in 12 tries as Batley had little answer to the tide of the visitors attacks. Batley survived an early attack but Rovers stormed back down the slope and Shaun Lunt drove play close from acting half back before slipping the ball out for Rob Mulhern to score and Jamie Ellis converted. 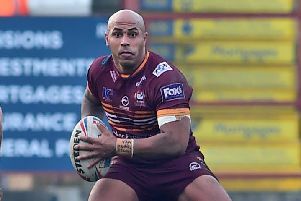 Ellis then turned provider after Batley dropped the ball in midfield as his long looping ball sent winger Ryan Shaw racing over. Batley briefly responded as Danny Cowling broke through but was hauled down by Ben Cockayne before he could get the ball away to Macauley Hallett. Rovers resumed their suremecy as Liam Salter sent Cockayne racing through a gap and Andrew Heffernan collected the final pass to complete the sweeping move, with Ellis converting. Ellis then sold a dummy and raced thriough before kicking the ball on and James Greenwood gathered before sending Jordan Abdull overto complete a length of the field move. Ellis converted and stretched the lead to 22-0. Rovers continued to score at almost a point a minute and added a further three first half tries. Ellis sent Cockayne racing through a gap and he offloaded to Heffernan, who in turn put Zach Dockar-Clay over to complete another fine attack, with Ellis again converting. Another long passs by Cockayne sent Shaw racing over at the corner for his second try before Rovers added a seventh try of the first half as more good handling by Maurice Blair and Cockayne sent Heffernan in for his second. Ellis tagged on his fifth goal and the Robins led 38-0 at half-time. It took Rovers just six minutes after the re-start to extend their advantage as Ellis exchanged passes with Greenwood to score between the posts and his conversion was a formaility. Winger Jake Butler-Fleming scooped up a loose ball and raced 80 metres for his first try in Rovers colours and Ellis converted to bring up the half century. There was no respite for Batley as Cockayne gathered a kick, linked with Butler-Fleming before cutting through and sending Shaw racing over to complete his hat-trick, with Ellis adding another goal. Dockar-Clay nipped over from acting half-back to grab his second try, which Ellis again improved. Batley’s efforts were finally rewarded with a 75th minute try as Mike Hayward squeezed in at the corner but Cain Southernwood was unable to convert. Rovers had the last word as they added a 12th try two minutes from time as Ellis raced away before Heffernan and Abdull linked to keep the move going and Butler-Fleming powered over at the corner. Ellis rounded off the scoring with his 10th goal of the day.